Adhesive mechanisms in the natural world, as used by geckos and other animals when they walk upside down on the ceiling, have many advantages: they are always strongly adhesive - and without any glues or residues. Scientists at Kiel University are researching how these mechanisms can be artificially created. An interdisciplinary research team from Materials Science, Chemistry and Biology has now succeeded in developing a bioinspired adhesive material that can be controlled remotely by using UV light. This way it is possible to precisely transport objects in a micro-range. The findings could be interesting for applications in the fields of robotics, industry and medical technology. The Kiel-based research team's results were published in current edition of the scientific journal Science Robotics. In nature, mechanical stimuli such as muscle movements ensure that animals' legs adhere to surfaces and can be detached again. The scientists in Kiel are using light to control their artificial adhesive mechanism instead, which they have built inspired by models from nature. "The advantage of light is that it can be used very precisely. It is reversible, so it can be switched on and off again, and that very quickly," says Emre Kizilkan from the Functional Morphology and Biomechanics research group under Professor Stanislav Gorb at the Zoological Institute. So the scientists first developed an elastic porous material (LCE, liquid crystal elastomer) which bends when illuminated with UV light, on account of its special molecular structure. When doing so, they noticed that the more porous the material, the more it bents. The researchers made use of this fact. "Due to their structures, porous materials can be very easily incorporated to other materials," explains Kizilkan. "So we tested what happens when we combined the elastic material, which reacts well to light, with a bioinspired material that has good adhesive properties." The result is an intelligent, adhesive composite material that can be controlled with light. The surface consists of mushroom-shaped adhesive microstructures, as can be found on the feet of some species of beetle. Flat or three-dimensional small elements such as microscope slides or glass spheres can attach and be picked up. When the composite material is illuminated with UV light, it bends. Because of the bending of the surface more and more adhesive elements detach from the object, until it can finally be dropped down again. "We were able to show that our new material can be used to transport objects. Moreover, we demonstrated that the transport can be controlled very precisely with light - on a micro-level," explains Kizilkan. Gorb adds: „We use light as a remote control, so to say. 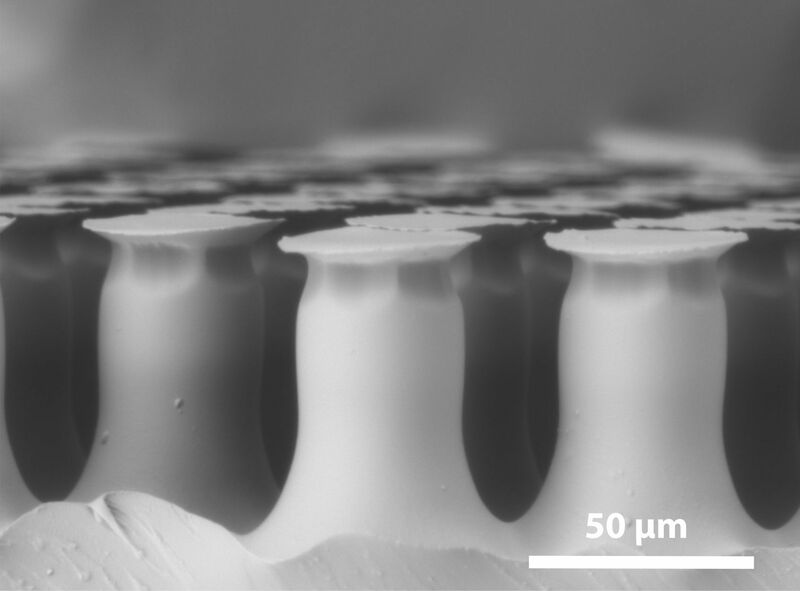 Our bioinspired adhesive material doesn't leave any residues on the objects, either." The research group's discovery is therefore especially interesting when building sensitive sensors or micro computer chips. They need to be manufactured in an environment that is protected from external influences and impurities, such as Kiel University's cleanroom. "In the long term, we would like to use the new material to develop micro-robots which can be controlled by light to move forwards and climb walls," is Professor Gorb's insight. 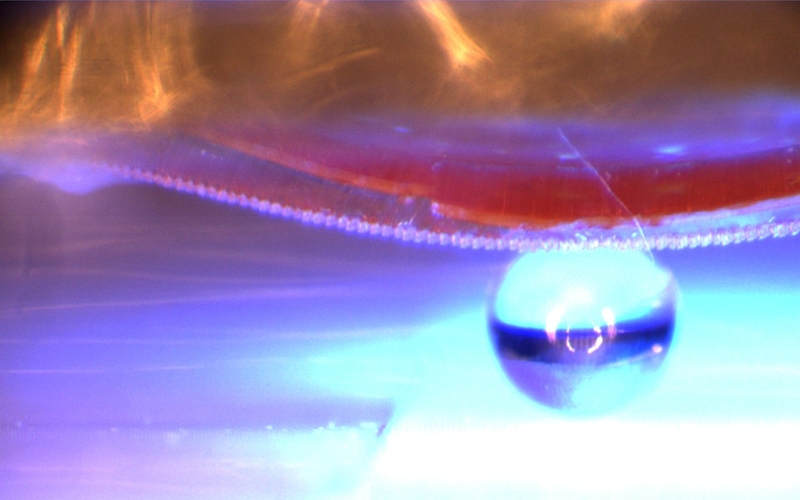 The video shows how the composite material picks up a glass ball with a diameter of 1 millimetre, transports it and puts it down again when illuminated with UV light. The research project is part of the Collaborative Research Centre (SFB) 677 "Function by Switching" at Kiel University, in which 100 scientists from Chemistry, Physics, Materials Science, Pharmacy and Medicine are working on a cross-disciplinary basis to develop switchable molecular machines which can be controlled by light, for example. When illuminated with UV light, the intelligent material with the adhesive surface bends. This way it can lift, transport and put down flat and three-dimensional objects (here, a 1 millimetre diameter glass sphere). The new composite material consists of two substances: an adhesive material (blue) and an elastic LCE (liquid crystal elastomer) plastic (yellow). LCE is made up of azobenzene molecules which bend - thus bending the whole material - when they are irradiated with UV light. The curvature causes the adhesive elements to detach from the object. The second, adhesive material is a polymer modelled on examples from nature. Its surface consists of a mushroom-shaped microstructure which becomes visible under the scanning electron microscope. It is recreated with highly adhesive, reversible adhesive elements, as can be found in some species of beetle. Precisely controlling micro-transportation using light: the new composite material (BIPMTD) adheres when laid on a glass slide (i). The glass slide can thus be picked up (ii). When UV light with a wavelength of 365 nanometres is switched on (iii), the glass slide detaches itself in 5 seconds and can be put down (iv). 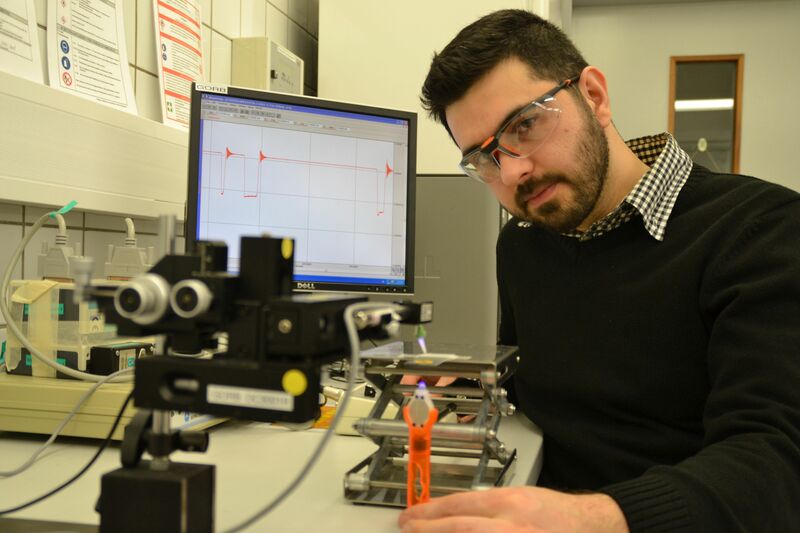 Materials scientist Emre Kizilkan tests how strongly the composite material adheres to objects when illuminated with UV light, using an experimental set-up for measuring strength.